An inherent requirement of Continuous Improvement is to set a goal that cannot be feasibly achieved - then pursue it with reckless abandon. Okay maybe not completely reckless but it's important to at least take it seriously. The phrase "shoot for the moon and even if you miss, you'll land among the stars" by Norman Vincent Paele applies here in full effect. Approaching your Lean initiative with this attitude sets the stage for creating a culture of perpetual improvement. In the last post, we covered how to define perfection for a manufacturing operation. This provides the North Star that we shoot for when we decide that we're going to do Continuous Improvement. Perfection, in this regard, is essentially to operate in a state of zero efficiency losses. This post dives into how to measure losses and determine exactly what type of waste is occurring in your manufacturing process. The second phase in the Percent Perfect Methodology® (PPM) is to Assess your efficiency losses against perfection and categorize them accordingly. The reason this is done is to categorize your losses in terms of availability, throughput, and yield, as is how Overall Equipment Effectiveness (OEE) is typically determined. This is also done to gain a deep understanding of which and how much of the 8 Lean Wastes are occurring. The PPM is a methodology designed to determine and systematize the few critical operational disciplines needed make dramatic progress toward perfection. The challenge to this approach is that sometimes learning how efficient you're not can be a bit difficult to swallow. Especially if you have a culture of using vanity metrics, or metrics that are designed to make the team look good as opposed to exposing real opportunities for improvement. I was approached by one supervisor as we were executing this part of the engagement who, in a state of desperation, asked that we not show their OEE number. Instead, let's use a number that doesn't count losses like start-ups, changeovers, waiting on product, shutdowns and others because he believed he didn't have any direct control over those factors. As I listened to him speak, it became clear that he wanted to show efficiencies at or above 100% so he and his team could feel good about their performance everyday. It seems that he was under the misconception that this would help make his team "more" engaged. Perhaps he was right that they would be more engaged, but what exactly was he trying to engage them in? It certainly wasn't Lean or Continuous Improvement. My comment to this Supervisor was to "look at Lean like a journey that starts now. The last Supervisor left off at 53% to perfection; your mission is to take this team and this plant to 83%. That's what you should engage your team to do"; and thus the buy-in process began for him. FYI...this Supervisor went on to lead his team to 78% after a few short months (and his team continued to improve after he was promoted). Having a consistent and reliable way to measure performance on an ongoing basis has the same effect of pro athletes having the statisticians on ESPN to track and report their performance numbers. By establishing a fair and objective way to measure progress, you level the playing field so that people can clearly see if they are getting better or not; and by how much. This also enables you to conduct a side-by-side comparision to see who's getting better, who's consistently doing well, and who needs help. You can also easily determine the true impact of process changes by assessing progress against your new definition of perfection. This is the part that makes manufacturing more like a sport than day-to-day drudgery. 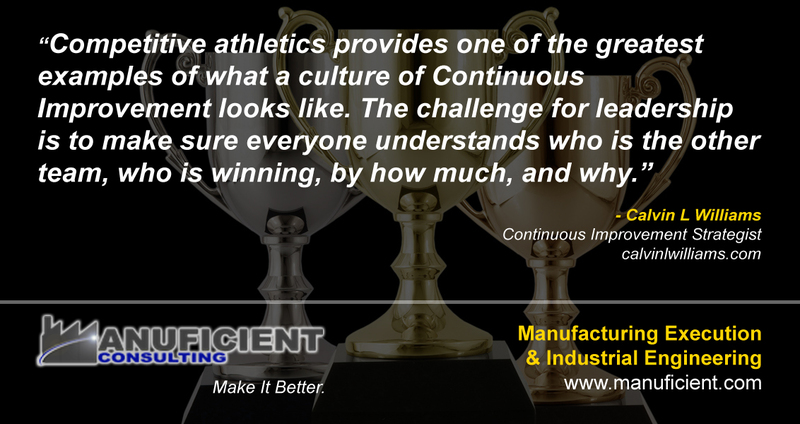 In comes the sport of: Continuous Improvement, where the winners are those getting better and executing at a high level. This includes setting personal records, breaking production records, raising the bar (outperforming the standard), and much more. From there, you can establish your own system of rewards and recognition including but not limited to: most consistent, most improved, top performers, broken records, and so on. You could even do your own version of the Heisman or MVP awards. How fun would that be? Finally, this step helps to uncover opportunities to benchmark the things that are going well and share them across the board to help underperforming teams, products, and production lines to achieve breakthroughs in performance. For instance, this analysis will reveal why underperformers are incurring greater costs than top performers, then help to close the gap. Fortunately, by using the Factory Operating System (fOS), Phase 2 (Assess) of the Percent Perfect Methodology® is completed automatically. As production runs are entered into the system, the calculation to categorize losses by downtime, rate loss, and yield loss is done automatically. It takes less than a minute to enter a production run and the system which allows you to group results by line, shift, team, individual, product, and several other options. This helps you to quickly see where efficiency losses are occurring and areas where process waste is being held to a minimal. It also shares success stories such as personal records, record breaking week, raising the bar (outperforming the standard), and others with people across your manufacturing network to drive a culture around getting better everyday. Additionally, the fOS is free for anyone in your organization to jump on and start using to measure themselves against and strive toward perfection. Once you've identified your North Star, which can also be viewed as Operational Perfection (OP) and provides the "compass" for your Continuous Improvement initiative, it's important to determine exactly where you are in the journey. The goal is to reach 100%, which is theoretically impossible but will keep you and your team striving to get better everyday. In fact, World-Class execution is widely considered to be 85% OEE. This means keeping total process waste to within 15% including start-ups, changeovers, shutdowns, unplanned downtime, rate losses, and yield losses. Remember to celebrate progress at every step of the way. As milestones are reached and records are broken, a culture will emerge that abandoning the status quo and getting better is the way to go; and there will be no doubt in anyone's mind about what Continuous Improvement is all about. A manufacturing efficiency expert such as those at Manuficient can help implement a low-burden system of measuring efficiency such as the fOS to initiate your journey to Operational Excellence.